department’s new Data 911 mobile computer system. The police department has installed a Data 911 mobile computer system in one patrol car in an effort to ease the collection of data by its officers. The system called TraCS stands for traffic and criminal software. TraCS is used by the New York State Police and is offered to police departments without charge. TraCS is being used in twenty states throughout the country. This software creates standardized police records that are easily read, stored and forwarded to numerous agencies. At the scene of an accident, incident or when issuing a citation, the officer simply scans the bar code of one or more driver’s licenses and registrations. The information is automatically imported into an accident report, incident report or uniform traffic ticket on the car computer. At the end of the officer’s shift, the information is downloaded wirelessly to the station’s server. After review by a supervisor, the data is automatically sent over a secure internet connection to the New York State Police. The State Police then forward the information to the Department of Motor Vehicles, the Office of Court Administration, the Department of Transportation and the Division of Criminal Justice Services. The next version of TraCS will also send data to district attorneys throughout New York. Local courts can connect to this information to retrieve electronic tickets written by the police department. Another important feature of TraCS is the ability to search for suspended licenses and stolen vehicles. 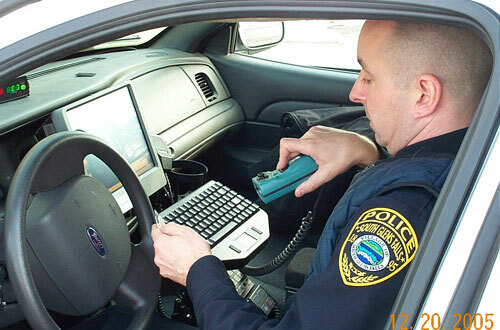 A file called the license and registration suspension/revocation and stolen vehicle file uploads daily to the car computer. Each time an officer scans a license or registration an automatic alert is issued if there is a suspension or if a vehicle is reported stolen. The TraCS software and mobile computer are the latest enhancements to the police departments records management system.